Dream about unique travel destinations around the world. Dream visiting and learning about remote towns and intriguing countries. In this post, we will take you on the four corners of our huge and diverse world to show you some jaw-dropping places. Places of which you either haven’t heard about or that you haven’t considered for your next adventure yet. Oh, no! Such a shame, right? I must admit I’m adding these places to my bucket list too. Now and then when I am feeling less motivated towards my goals, I either refer to my bucket list or to this list of inspirational quotes. Works every time. I solemnly swear to create memories that last a lifetime. I vow to make an impression on the world, not the couch. I promise to dream about unrealistic goals. And make them my reality. Antarctica definitely isn’t a destination for everyone’s bucket list, but it should be on the bucket list for every person who loves to travel. When I’m at home, I’m constantly plagued by wanderlust. I want to see new things, explore new places, and push myself to the limits. Antarctica was a place that let me satisfy each of those cravings. One thing that is incredible about this unique travel destination is the wildlife. Penguins are naturally curious, and they’ll sneak up on you to nibble on your jacket while you’re looking elsewhere. Leopard seals will circle your zodiac boat, so when you land you have cautiously exited the boat, otherwise you could find yourself face to face with an apex predator. Lazy crabeater seals will watch your ship go by, hardly caring. Even whales will put on a show as you quietly wait for them to surface. I’ve never been to a place that is teeming with so much wildlife. On my trip, twice a day we visited a different location. It might be easy to write off Antarctica as a snow-covered wasteland, but I can assure you that each place we stopped was unique in its own way. From snow-covered hills that offer views of surrounding mountains to bays filled with glaciers that you explore from zodiac or kayak, and stony beaches where penguins call home, to small settlements where people live, Antarctica has something for everyone. Some mornings we spent boating around shipwrecks, and some afternoons were spent throwing snowballs at each other as we made our way to a scenic overlook. I had an opportunity to watch an avalanche from a kayak, I swam in below freezing cold water, and I danced under the southern hemisphere stars night after night. There is nothing on the two-week voyage that felt redundant. Except for the smell of penguin poop that infiltrates everything. The Dolomites should make any Europe bucket list. Spread across three regions of the North of Italy (Trentino Alto Adige, Friuli Venezia Giulia, and Veneto), they are a fantastic place to visit in any season, either during the snowy winter, when it is possible to go skiing, or in the summer or the fall, when the many hiking trails provide plenty of opportunities to immerse oneself in the nature. But there’s more. Summertime in the Dolomites also means having the chance to attend one of the free, open-air concerts of I Suoni delle Dolomiti, a fantastic music festival where the best musicians from around the world are invited to play in open spaces such as valleys and forests, at any time of day. The best concerts are those at sunrise, for the views are splendid and there’s nothing better than listening to quality music when the sun is rising over the gorgeous mountains. There are many hiking trails in the Dolomites. Some of them are short, yet tough and rewarding with great views. The hike to Corno Bianco and that to Alta Via dei Monzoni are just a couple of them. The latter goes along the Italian and Austrian trench lines of World War I so it is a fantastic place to learn a bit more about the technicalities of the Great War. A longer trail that takes a few days is that of the Brenta. Other reasons to put the Dolomites in any Europe bucket list are the delicious food and wine – this is Italy, after all! A couple of spas make it a great destination for anyone needing to relax. QC Terme, in Pozza di Fassa, has fantastic views of the mountains – nothing better than relaxing in a jacuzzi while admiring the view! The choice of places to stay is incredible – there’s anything for any budget, and there’s plenty of accommodation suitable to any need, from solo travelers to families with children to people traveling with their pets. One of our most longed-for destinations to visit is a place that is beyond a vacation destination, but rather a living myth – the city of Troy. Until the late 19th century, Troy stood much as Atlantis stands today – a legendary location, spoken about by poets and mystics for millennia, but commonly thought to be a fabrication or allegory. It wasn’t until the late 19th century when the ruins were uncovered in Western Turkey, verifying claims of the fabled city which was called the site of the Trojan War during the classic Greek period. As lovers of history and travel writers who have been to Machu Picchu, the Acropolis in Athens, and touched many of the ruins in Rome, Troy stands as perhaps one of the most mystical location in the world that we have yet to see. It somehow seems older than history, itself, and its very existence seems to indicate a limitlessness and expands what is possible. This place, so long thought to be the figment of philosophical imagination now has a real place in history and makes travelers and explorers wonder what else might be out there that we have yet to see and discover. This really, to us, hearkens to the heart of the traveler. It’s the spirit of exploration that led to the rediscovery of Troy, and it’s that same spirit that leads people to venture into unknown places, to expand their own realities, and push beyond their boundaries to discover more about the world around them. It’s a place we simply can’t wait to see! I just recently surprised my husband with a trip to the Maldives for his 50th birthday. We left the kids at home for the first time and made it all about us. One thing I have wanted to do for a long time is learning how to scuba dive. My husband is already scuba certified and he decided that if I try it and don’t like it, at least I learnt in the most amazing place to scuba dive in the world. I signed up for a Scuba Discovery lesson which taught me the basic skills in the resort swimming pool prior to heading out to the ocean. I was a little nervous as I had panicked a bit in the pool and I was nervous I wouldn’t be able to do it in the ocean. We dropped in at the arrival jetty onto the house reef and straight up I saw a beautiful majestic turtle. I instantly forgot everything and natural breathing kicked in and I was off. I had an experience dive instructor monitoring me at all times and went to about 10m and stayed underwater for 40mins. We returned to the arrival jetty feeling exhilarated and ecstatic, the first thing I said to my hubby was ‘let’s have another go tomorrow’! We returned to the dive centre and booked a different tour for the next day. This one took us 30mins from the island resort and dropped us onto the Thali Reef in the middle of the Huvadhoo Atoll. We went to about 10-11m below and the water was pure and crystal clear. The reef was amazingly healthy and alive with the most abundant amount of sea life. I saw schools of fish, almost running into goggles. There were reef sharks, turtles, and so many clownfish. It was amazing and while I would have liked to have another dive it wasn’t to be this trip. I am, however, planning a trip to Malaysia next year to have myself and the 3 kids PADI certified. Gyeongju is the oldest cities in Korea dating back to 700 AD as it used to be the ancient capital of the Silla Kingdom. Now it is a peaceful city filled with stunning UNESCO sites. It is the perfect place to go for anyone who wants to visit the more hidden parts of South Korea. Visitors can at least spend a couple of days in Gyeongju as there is an abundance of sites to visit in and around Gyeongju. The best way to go around is by renting a bicycle or by taking public transport. The must-see sites are without a doubt Bulguksa Temple and Seokguram Grotto (which are located just outside of Gyeongju), Cheomseongdae Observatory, the Tumuli Park, Anabji Pond and the National Park which is filled with stunning temples, rock-carved statues, and pagodas. All these historic sites date back to the Silla Dynasty and have all been restored the way it used to look back in the days. It is easy to take the KTX or bus from Seoul or Busan which will take around 2 – 3 hours by KTX and 4 – 5 hours by bus depending on traffic. There’s something about remote islands that really appeals to me. On my very first international trip to Vietnam, I booked a ticket for Phu Quoc a couple of days before going there. I have been to some of the most interesting islands in the world since such as the Channel Islands, the Canary Islands, Azores, Koh Tao, and even Madagascar. The one island that’s been on my mind forever is the Faroe Islands. Something about its ruggedness and location makes me want to jump on a plane and get here ASAP. I fear tourists will find out about it and descend here the way they go to Iceland. I want to see puffins and hear their birdsong without selfie clicks going rat-a-tat-tat. It’s unlikely to happen given how short the tourist season (May – September) on the islands is but you never know! It’s also a unique place in that the Faroe Islands do not belong to the European Union but are under Danish custom rules. They have their own trade associations to deal with other countries despite not being fully independent. To me, it sounds like what Brexit would look like once it comes through. Best of all, there is no need to prepare an itinerary for the Faroe Islands. There aren’t that many things to see or places to go to. Instead, for nature lovers like me, the islands are the perfect backdrop to reclaim some connection with flora and fauna before going back to our noisy and polluted cities. Hopefully, with the sound of puffins ringing in our ears. Now, that’s what I call a bucket list experience right there. There are many reasons we choose to travel: to see new sights, discover new cultures, meet new people or see the iconic landmarks or landscapes. Mine is to see wildlife in its natural habitat. And Borneo is one of my favourite places to explore. Lying along the equator, in the Malay Archipelago, Borneo the third largest island in the world. And it is home to some of the oldest tropical rainforest on earth. The dense jungle of Borneo hides some of the weirdest and wonderful animals, many of which are not found anywhere else. The unlikely-looking proboscis monkeys, Critically Endangered Borneo orangutans, pygmy elephants, and Sunda clouded leopards are all unique to the island of Borneo. The island is divided between three countries: Indonesia, Malaysia, and Brunei. And while the rate of deforestation on the island is alarmingly high, the Malaysian state of Sabah retains the highest proportion of its forest cover. The National Parks of Sabah are the best areas for spotting wildlife in Borneo. I have visited Sabah a number of times, and it still remains at the top of my bucket list. One of my favourite spots for wildlife watching in Borneo is the lower Kinabatangan River, near the village of Sukau. This is the best place to see the island’s wildlife up close. Cruising along the river I have seen orangutans, elephants, proboscis monkeys, hornbills, crocodiles, slow lorises, tarsiers, and even the endangered flat-headed cat. It is one of the rare few places, where there seems to be more wildlife than people. Ever since I visited Thailand for the very first time in 2017 many travellers told me about the amazing backpacker town of Pai in the northern mountains. Unfortunately, I ran out time to make it that far north and had to wait until I returned early in 2018 to get another chance to visit. This time, Pai was on top of my Thailand bucket list destinations. I boarded a 3-hour bus from Chiang Rai and set off along the ‘762 bend road’, notorious for giving traveller’s motion sickness. Pai should be on every traveller’s bucket list, as there is so much to do! Walking Pai Canyon gives beautiful panoramic views of the area, and mix a colourful sunset in there, it is truly a stunning place. There is also short little hikes around the rim of the canyon or on the dry valley floor. For more intense hikes, visiting Mae Yen Waterfall, one of the many around Pai, is a beautiful, mostly flat (there is one super steep section though) jungle hike. At the base of Mae Yen Waterfall, there is even a small pool for a refreshing dip! My favourite day trip in all of Thailand also begins in Pai. Tham Lod Cave is just over one hour drive from the tiny town of Pai. Taking a lantern tour through any of the 3 cave systems of Tham Lod cave is stunning and eerie at the same time. If you can spare the time (and some motion sickness pills) to make it up to Pai in northern Thailand, it is beautiful and quiet town is worthy of being high up on that travel bucket list! Nepal is an amazing destination with many popular trekking destinations, such as Everest Base Camp or various treks in Annapurna. During our visit to Nepal, we trekked to both Everest Base Camp and Rara Lake. Although the trek to Everest Base Camp was incredible and definitely a highlight, it wasn’t as memorable as our trek to Rara Lake. Rara Lake is an off-the-beaten-track destination, located very remotely in the West of Nepal on a 3000-meter high mountain. The trek to Rara Lake is one of the highlights of our travels so far, as it’s an absolutely gorgeous place, which is even dubbed as Heaven on Earth by Nepali people. If you’re looking for real adventure, solitude, and a totally unique experience, then Rara Lake is the place for you. The adventure isn’t necessarily the place itself, but the journey to get there and back. Rara Lake isn’t touched by commercial tourism yet, and the Nepali tourists that do show up usually don’t trek to Rara Lake, but go with a bus or jeep all the way up the mountain. This means that you can trek to Rara Lake completely alone and you’ll only encounter local people that live in the mountains. It’s definitely a challenge to get to Rara Lake, but one that should be included on your bucket list! Psst: Subscribe to our newsletter to receive more inspirational articles in your email. Bonus: get free access to our private library full of freebies. Subscribe! It’s been in my dreams for ages and I haven’t reached there yet. To be really honest, I haven’t read anything about it and yet, I fell in love even before looking at the stunning pictures representing its’ untouched wilderness and stunning nature, deserted beaches, thick forests, breathtaking sunsets and sunrises, wooden houses and warm welcoming people. You might argue that those are elements that you would easily find in many other destinations. And I can agree with that, but the fact that is so remote makes me think of a forgotten place where nobody goes and therefore still untouched by human voracity, where nature is to be found in its best manifestations and people are extremely peaceful and welcoming. But I don’t want to just go for four days or a week. I love to travel slowly in general and more in Tasmania where I want to take my time and explore every corner, understanding the local culture meeting some kangaroos, probably find a housesitting assignment, getting to know the neighborhood and live like a local. I’ve always had a special feeling for remote places, the more remote the more beautiful it should be. As for Tasmania, I have the feeling that if heaven on earth exists, that will be in Tasmania. I will find out soon, I hope. The Ile de Ré is a charming, laidback island, about 14 km from La Rochelle in western France. It’s geographically small (at just 30 km long and 5.5 km wide) but it makes up for this by being totally gorgeous. The impressive 3 km bridge, feels like a sort of watershed – as you breathe in the salty fresh air, it feels like you’ve left the stresses of modern life behind on the mainland and entered the spirit of the holiday. One of my favourite things about the island is the villages. They’re almost universally lovely, whitewashed gems with daily markets and cobbled winding streets. La Flotte and Saint Martin de Ré both have pretty marinas where fishing boats and yachts bob in the water, surrounded my quaysides full of restaurants and sprawling outside seating. The beaches are also divine. My favourites are in the southwest of the island where they’re long, sandy beauties, backed by grass-covered dunes. Kids love messing around in the shallows, adults may love the charming casual restaurants tucked away behind the sand dunes. The best way to get around the island is on two wheels. There’s something liberating about staying somewhere where cycling is easier than driving: the island boasts 100km of good quality, traffic free, largely flat cycle routes. You can cycle between the villages or head up to the area west of Saint Martin de Ré. I love the bike paths around Loix, Ars en Ré and Les Portes en Ré – they weave between watery salt beds and the sea. Go in the early morning or as the sun sets and you’ll find yourself surrounded by birdlife and incredible reflections in the water. There’s a reason that wealthy Parisians return to the Ile de Ré year after year – and why it’s top of my bucket list to return to! Get it on your list now! The Camino de Santiago de Compostela (to use its full name) is a medieval Christian pilgrimage that has not only remained relevant over the hundreds of years since its inception but is actually increasing in popularity. Originally, the pilgrimage began wherever the pilgrim happened to find themselves in Europe but nowadays there are a few well-worn routes across Northern Spain and Portugal. It is said that the bones of St James reside in Santiago de Compostela, hence why the Camino is also called The Way of St James. Over the years, infrastructure has meant that Pilgrim-only hostels have opened along The Way and pilgrims can experience Galician hospitality (and wine) for however long it takes them to walk, which is usually over a month. Pilgrims collect stamps on a special passport as they make their way to Santiago and can obtain a certificate for completing The Way. The Camino de Santiago was brought to my attention via a podcast, but it wasn’t really engraved in my mind until I watched The Way (2010), a feature film starring Martin Sheen who portrays a man walking the Camino Frances (the most popular route) in the name of his son. The Camino seems like the perfect combination of so many things I love about travel that I’ve been obsessed with the idea of it. The physical challenge, meeting fellow travellers and locals, brushing up on my Spanish and delving deeper into Galician culture over a significant period of time. In fact, the length of time to complete the Camino Frances (764km) is the only reason I have not already completed the pilgrimage. But when I take my first step along the famous yellow arrows of the Camino, the few years spent saving and planning will all be worth it. Located in the North West coast of Spain, Galicia will always feel like home to me: the place where I was born and bred and the one I return to in between my travels around the world. And believe me, I would have definitely changed that should it was not a dream destination. Without the big hotels and tourism complexes other areas in Spain are filled with, the development of tourism is still at a good pace in Galicia. People have finally understood sustainable and ecotourism is the way to go and all the efforts entrepreneurs are making go towards an environmentally friendly tourism. One of the best examples is St. James Way, a UNESCO World Heritage Site. This pilgrimage that comes from the Middle Ages that has been bringing hiking enthusiasts to Galicia ever since. Slow tourism, locally produced food, Galician managed initiatives, and a great natural environment make the rest. But hey, it is not just me the one who thinks Galicia is a place that should be topping this list of ecotourism destinations for 2017. Have a look at other Galician highlights you can’t miss here that have been recommended by some of the top bloggers in the region. Enjoy! New Zealand’s South Island is home to some truly incredible nature. It’s home to Mount Cook, Milford Sound, stunning glacial lakes and more! As the South Island is home to so many of the best places to see in New Zealand, it’s one of the most breathtaking bucket list destinations in the world. The South Island of New Zealand was on both of our bucket lists and is one of the first places we travelled together. It’s an incredible place for adventure, thanks to the astounding nature found throughout the island. As you travel through the South Island you’ll be rewarded with stunning views of the towering Southern Alps, beautiful lakes and picturesque coastline. One of the highlights of any trip to New Zealand’s South Island is a visit to the iconic Milford Sound. Day trips to Milford Sound run from Queenstown, taking in some of the best scenery in all of New Zealand – from rushing waterfalls to amazingly still mirror lakes. The trip culminates with a cruise through the Fiord itself to see spectacular peaks, wild rainforest, and more powerful waterfalls. If you’re lucky you may even see dolphins, penguins, and seals too! Although Milford Sound alone is enough reason to visit, there’s so much more to see on New Zealand’s South Island. Queenstown itself is a quaint town, set beside a huge glacial lake and the colossal remarkables mountain range. Then there’s the charming coastal town of Kaikoura, from which whale watching tours get you up close to incredible marine life. There are also the impressive Franz Josef and Fox glaciers, as well as the beautiful Abel Tasman National Park. With some truly phenomenal nature to discover, New Zealand’s South Island is certainly a perfect destination for anyone’s bucket list! The second I saw a photo of the Cuernos del Paine in Torres del Paine National Park, Chile I had to go there. I can’t think of any scenery more stunning than the dramatic peaks and bright blue lake and I decided immediately that I had to see them in real life. Well, I tried. I was in Patagonia almost 20 years ago and was excited to do the ‘O’ circuit 7-day hike around the entire park. I started and made it as far as the Torres del Paine – which are stunning – but then my friend who I was hiking with got sick so we decided to turn back. Other personal stuff was happening back at home, so we both abruptly left Chile. I STILL hadn’t seen the Cuernos del Paine, so they have remained on my bucket list ever since. I have a trip planned for this November to go back and do a modified version of the shorter ‘W’ trail (I’m a little older and less ambitious) and can’t wait to see them in real life at last. This version of the hike I am doing will have me seeing and walking on Grey Glacier, finally seeing the incredible Cuernos del Paine, hiking to the beautiful French Valley, and then returning to the dramatic Torres del Paine. (And hopefully seeing some vicunas and rheas as well). This national park is the arguably the best in all of Patagonia and I can’t wait to go back and see it all. Bregenz, Austria is ideally located in Europe. It sits at the edge of Lake Constance in an alpine wonderland that’s just a hop, skip, and a jump from Germany, Switzerland, Italy, France, and Lichtenstein. Scenic Bregenz also hosts a popular performing arts festival in July and August with a floating stage and outdoor amphitheater hosting live music and opera performances each summer. Bregenz is also a paradise for active travelers. Cycle lovely Lake Constance…Choose from a short and scenic bike path on an electric bicycle or go hard-core all the way around the lake. Don’t miss out on hiking the Pfänder, the wildflower-strewn mountain that rises right out of the center of town. It’s an easy ascent with the convenient panoramic cable car up. In winter, Bregenz is home to world-class skiing and snowboarding with 23 ski resorts that cater to every skill level. Any time of year, Bregenz is a feast for the senses. For anyone who dreams of an African safari, the Ngorongoro Crater is the ultimate bucket list destination. The crater is the world’s largest intact volcanic caldera. Ngorongoro Crater is home to a diverse range of wild African animals including rhinoceroses, elephants, leopards, zebras, buffalo, and wildebeests. The area is also the home to the highest density of lions in Africa. Each year over 1 million wildebeest, 70,000 zebra and 350,000 gazelles migrate through the crater. It is considered the largest animal migration in the world. For me, it is the ultimate adventure. Descend into the crater, on the edge of your seat searching for animals. Being able to watch as they hunt, eat and play on the plains would be an experience like no other. We have traveled to Botswana where we managed to stick to a tight budget on a self-drive safari. Observing wild animals in their natural environment, being up close to elephants, zebra and giraffe is a thrilling experience. We listened to the howls of wild dogs and the thunderous roar of lions while lying in bed each night. The trip is one of my most memorable travel experiences. Unfortunately, a trip to the Ngorongoro Crater doesn’t come cheap. The Unesco World Heritage Area is relatively small with huge tourist demand. The result is exorbitant entry fees, making it one of Africa’s most expensive National Parks. There are many other incredible destinations in Africa. However, if money were no object, I would be booking my trip to the Ngorongoro Crater in a flash. If you are planning a trip to Italy, take some time to spend your time “Under the Tuscan Sun.” This diverse and culturally rich region of Italy was the birthplace of the Renaissance, home to fashion powerhouses like Gucci and Ferragamo, and renowned for its abundance of wine and farm-to-table food. You can’t visit Tuscany without going to Florence and seeing the Duomo, Florence’s famous cathedral, and the Uffizi Gallery. And you definitely can’t skip seeing Michelangelo’s David in the Accademia Gallery! In fact, everything in Florence is worth a visit, but Tuscany has so much more to explore. You can walk in the footsteps of Galileo as you climb the Leaning Tower of Pisa and overlook the Piazza dei Miracoli. Or, take a step further back in time and explore the charming, Medieval walled city of Lucca or the towered town of San Gimignano. Head a few kilometers south of Florence to Chianti, and indulge in wine from Tuscany’s iconic vineyards. Spend the day in Siena visiting the Piazza del Campo and the city’s cathedral which has an incredible black and white façade and a gorgeous marble mosaic floor. Try some truffles in San Miniato, an agricultural town midway between Florence and Pisa renowned for its white truffles. There is so much to see and do in Tuscany, you won’t be able to cover it all in one visit. But, that just means you’ll have to come back and enjoy it all over again! From the rolling hillsides dotted with picturesque villages to bustling cities overflowing with art from Renaissance masters, Tuscany isn’t just a destination, it’s an experience. Top of my bucket list is The Azores, an archipelago made up of nine volcanic islands and located in the Atlantic Ocean roughly 1,600 km from Lisbon. While I’ve been to most of Portugal, from the coastal and towns in the Algarve to the rural and much colder towns and cities in the north of Portugal, I’ve never made it to The Azores. The Azores are incredibly beautiful and extremely verdant-looking: they look more like Ireland than Portugal. Of course, this is a very different part of Portugal: a region that’s so far from the mainland that there are going to be differences in the culture, in the language, and in the food. I’ve been working my way through Portugal’s many regional cuisines for several years now, and have eaten food from almost every region of Portugal. Earlier this year, I visited Madeira and was able to tick off a few of their regional specialties including espada com banana, espetada, and bolo de caco. Having visited Madeira and tried the food there, I’m now even keener to make it to The Azores and try dishes like cozida, alcatra, and massa sovada. As well as the food, I’m also keen to experience all the outdoor and natural experiences The Azores has to offer. Whale watching, hiking, diving, and surfing are all big activities there, as well as visiting the islands’ many thermal baths. Given that I’m so keen to visit the Azores, what’s stopped me visiting up until now? Basically, the weather. Outside of the summer months (June – September), the weather in The Azores can be wet, foggy, and stormy, and the summer is considered the best time for outdoor activities like hiking and mountain biking. Over the last few years I haven’t been able to make it during the summer months, but hopefully, that’ll change next year. Tower Butte in Arizona wasn’t on our bucket list until we spotted it during planning for our Grand Canyon trip, whereupon it went straight on there. A butte is an isolated hill with steep, near vertical, sides and a flat top and because of this Tower Butte can only be accessed by skilled rock climbing or by helicopter – we chose the second option! Taking off from Page Airport at sunrise, you see Lake Powell bathed in the early morning light as you head towards Tower Butte. When we were there, the lake was low revealing the white sides of the coastline that are underwater when the lake is at capacity. As we approached the butte, the pilot made the helicopter gain altitude so that we could land. With enough altitude, we saw the top of the butte, which was larger than we anticipated, and the pilot gently brought us down. At the top, you have about 20 minutes to explore, which was plenty to do a circuit of the entire perimeter of the butte, peer nervously over the edge, and take lots of photographs. Being so early, the light was magnificent and the long shadow the butte casts over the desert made for great photos. There are almost zero signs of civilization to see from the top, just a solitary power plant, leaving you feeling quite isolated. In places, the unevenness of the top means even the helicopter is out of sight. Once it’s time to leave, if you’re lucky, your pilot may ask if you want the normal or exciting take-off, our advice is to go exciting! It felt like the pilot all but tipped the helicopter off the side of the butte and let it fall to earth and swing around the butte we had just left. On the return to the airport, we were fortunate enough to fly over Glen Canyon Dam and the spectacular Horseshoe Bend to end a fantastic trip. Egypt is one of the countries that are present on every bucket list. And there is a good reason for that – who hasn’t dreamed of exploring the mighty pyramids or the mysterious Sphynx? But what if I tell you there is a place in Egypt with way more history, artifacts, and ancient Egyptian culture than Giza, a place where you can see the mummy of one of the most famous Pharos who ever lived, a mythical place of gods, temples, and tombs. A place called Luxor. Formerly known as Thebes, Luxor was the capital of great Upper Egypt and has more than 5000 years of history in it. From the extremely instagrammable Karnak temple to the very well preserved Luxor temple, there are few places in the world that can rival Luxor’s cultural treasures. But what skyrockets Luxor to the top of the bucket list is actually the valley next to the city. Called The Valley of the Kings, this limestone wasteland was used by the Egyptian pharos as a burial ground for nearly 500 years! The combination of sand, rocks, and darkness managed to preserve the tombs so well that you’d never believe you are going down in 3000 years old construction. In this very place, the British archaeologist Howard Carter discovered the tomb of the 18th Dynasty Pharoah – Tutankhamun. The tomb is open for visitations today with the original mummy of King Tut still inside. The desert city of Luxor is a place that embodies the ancient Egyptian spirit and really is one of a lifetime bucket list experience. Parícutin is the world’s youngest volcano, found in the Michoacán state of Mexico. This volcano was on my bucket list because you can climb it, and who wouldn’t want to climb the world’s youngest volcano? Also, it is one of the Seven Natural Wonders of the World, so for me, it’s a must see. The volcano started to form on 20th February 1943. A farmer was working and the ground suddenly swelled and formed a fissure. The volcano developed and grew over the next few years and finally died in 1952. It is not only the youngest volcano but also the only volcano that humans have witnessed the whole lifecycle of. This volcano is especially special to me, as I and my husband climbed it on our second anniversary, we say we changed our Cotton Anniversary to an Ash Anniversary. It takes a full day and is challenging. The first step is to get to the nearest town, Angahuan, then it’s an easy task to find a guide. The guides only take you on horseback, as even riding it takes a few hours to reach the base of the cone. Then you can climb to the crater. Parts of the crater are still hot, you can even see the steam rising from the rocks and hear the rocks hissing if you hold them to your ear. It’s a difficult climb, as the ash doesn’t give good purchase, it’s basically a scramble. The way down is much easier – just slide down! On the way back to the town you can also see the remains of the church of San Juan Parangaricutiro. This is amazing, the church is in ruins, with frozen lava flows going through the remains. It looks like a dragon’s’ lair. You can see the volcano behind the ruins and it is a moving sight. As a big fan of everything Italian, I have an extensive Italian bucket list, and high up on that list you find the city of Matera. Matera is located in the region of Basilicata, in Southern Italy, and is famous for its extensive cave-dwelling districts called the Sassi. The dwellings lead back to the first human settlements in the world and were inhabited up until the 1950s, but due to the unhygienic conditions of the dwellings, a law was passed that forced the population of the Sassi to areas of the developing modern city. For a long time, Basilicata was known as a very poor region, but the increasing interest in Matera among tourists has bettered the economy in the region. The ancient sections of Matera are composed of two Sassi – Sassi Barisano and Sassi Caveoso, and you can explore them both by foot. If you want to get a sense of what life looked like when the Sassi were inhabited, you should spend some time in Sassi Caveoso as it hasn’t been “beautified” for tourists. Sassi Barisano, on the other hand, has undergone a big transformation with old caves having been beautifully refurbished to create stunning art spaces, boutique hotels, and traditional restaurants. It is also worth noticing that Matera was included on UNESCO’s World Heritage List in 1993, and in 2019 Matera is the European capital of culture. What do you think of when you think about Greenland? Remote? Ice? Empty? Greenland is one of the destinations on my ultimate wish list. Why? It’s difficult to get to, so it isn’t well traveled. It’s full of majestic scenery. It’s so rugged, that it is almost like being on another planet, except you aren’t! Greenland is the world’s largest island and 80% of it is covered by ice. The ice is so heavy that it has pushed part of the island below sea level. I can’t even imagine this! Nuuk is the capital of Greenland and also the largest city, with a minuscule 16,500 people. New York City is more than 500 times that population. Most other cities in Greenland only have 4,500 people or less. Greenlandic is the official language in Greenland, though many also speak Danish and English, particularly those in the tourism industry. Danish acts as the second language, since Greenland is an autonomous Danish territory (it and the Faroe Island are parliamentary democracies within the Kingdom of Denmark), where the population is known to be warm and welcoming to tourists. However, it is not easy to get to Greenland (flights are only available from Iceland or Denmark) and it isn’t easy to travel between destinations. You can fly between them on small planes and some places are accessible only by helicopter. The trouble will be worth it; traveling to this majestic, unspoiled country will be rewarded. First, there is ice. Massive, incredible amounts of ice. In the summer, you can experience the midnight sun, and in the winter you can experience the magical Northern Lights. Despite the effort it takes to get to Greenland, the towns do have decent tourism infrastructures. The reason a remote destination like Greenland calls to me is two-fold. I’m attracted to destinations that many people won’t make an effort to visit; maybe it’s too cold or rugged or expensive for most vacationers. Many people don’t see its icy appeal. It’s amazing to me to be in an area that so few have ever experienced. Second, the country is vast with such a stunning and unusual landscape. I love that feeling of being small and alone while being connected to the earth by gazing upon its beauty. Petra is one of the few places in the world that not only lives up to expectations but exceeds them – this is our best vacation ever! Exploring this ancient city had been on our bucket list for years. The main attraction for visitors is the picture-perfect Treasury – a building that was made universally famous by the movie Indiana Jones. However, the Treasury is just one part of a huge ancient city that has many incredible places to explore, you really feel like you’re travelling back in time. Tucked into the canyons in the middle of the Jordanian desert, Petra has an adventurous feel. This starts with even getting to the ancient city as you have to walk through a 1km long canyon to get there! Your first view of the Treasury, carved into one of the walls of a narrow canyon, is one that you won’t forget. You can choose to take it in at the ground level or climb up to one of several viewpoints and see it from above. Don’t miss “Petra By Night”, an event that runs three times per week when the Treasury is lit up by candlelight and traditional music is played – it’s truly magical. Definitely a unique travel destination! If you like to venture a little off the beaten track we also recommend doing the Little Petra to Petra Walk, a quiet trail that takes you from Little Petra to The Monastery, a building as grand as the Treasury but with far fewer visitors. This building is a fitting end for a beautiful walk through the desert and you can choose to take it in at the nearby café or from the mountaintop viewpoint. If you haven’t had your Petra fix yet, then we’d highly recommend taking in the view from the High Place of Sacrifice. Whilst you won’t see the Treasury or Monastery from up here, you’ll get a feel for just how big the ancient city was and see features such as the Royal Tombs, Roman Amphitheatre and the canyons that hid the city away from the outside world for so long. Peru is famous for the Inca ruins, everybody knows Machu Picchu and it’s on many bucket lists – as a result, the sight is very crowded even though the number of visitors is limited there are still 5000 people a day coming there. Not many know about another Inca ruin hidden in the mountains – Choquequirao ruins “a little sister of Machu Picchu” how it’s often called. The main reason Choquequirao ruins are still off the grid experience is that to get there people have to walk for 2 days – there is no road or railway going that way. Choquequirao complex is big and includes the Lower ruins that mainly consist of terraces and the Upper ruins with a wall, stones houses, and squares – similar to Machu Picchu structure. One can spend a couple of days exploring the area, there is no time limit on staying at the ruins. A designated campsite at the Lower ruins with basic facilities; toilet, basins, and cold shower is free to use for visitor, there is only entrance fee to the ruins that are paid at a checkpoint on the way and then you can stay around for as long as you wish, of course, you must have enough food supplies as there is no place to buy food at the ruins. Usually, there are no more than 20-30 people a day at Choquequirao, walking around the ruins does give you a feeling of being somewhere in the Lost World – impressive ruins hidden in the mountains with stunning views over the surrounding area. The highlights of Choquequirao; 24 llamas terrasse, El Mirador, sunrise at the Upper Ruins. Havasu Falls is a sparkling, light blue waterfall located in the Arizona desert near the Grand Canyon. The Havasu Creek, which feeds into Havasu Falls, helps the harsh Arizona desert area come to life. The blue creek surrounded by lush green trees and sprouting grass in the middle of the desert will remind you of a hidden oasis. Getting to this Instagram famous waterfall is not an easy feat though. To even set foot in the area, you need to get a permit from the Havasupai Tribe. Since this waterfall is known worldwide, obtaining the permit is extremely difficult. The permit sale opens every February first, and they sell out within a few hours for the entire year. If you are lucky enough to obtain the permit, the next challenge is getting to the waterfall. Many people tend to think Havasupai is located inside Grand Canyon National Park. When in fact, the waterfall is a three and a half hours drive away from the Grand Canyon National Park entrance. So getting to the waterfall is a bit out of the way. Once you arrive at the trailhead, you have the option to hike, helicopter in or ride mules to carry you and/or your equipment. Helicoptering in can be a long process, so your best bet is to hike. The hike tends to put people off because it is 10 miles one way. There is also no day hiking, so camping gear and equipment are needed to stay the night at the campground. With all the troubles trekking to the waterfall, I still feel like it is a unique bucket list destination. I think that the obstacles enhance the beautiful elegance of the waterfall. The challenges and the bright blue waters are what make Havasu Falls a fantastic adventure. Riding in a cable car trolley that’s been operating since before your parents were born might not be on everyone’s bucket list… But as a big fan of exploring abandoned towns and pursuing quirky travel experiences, it was something I really wanted to try! Chiatura is a small city located in the Republic of Georgia in the Caucasus. In its heyday, it was a mining town. To boost worker productivity and make it easier for locals to travel around the town—which is set across a deep gorge—a set of cable cars were erected in the 1950s. It’s said that Joseph Stalin himself, the leader of the Soviet Union of which Georgia was a part, gave the order for the 17 cable car lines to be built. This led to the nickname ‘Stalin’s Rope Roads’. Chiatura’s mines dried up, but incredibly, many of the cable cars were left behind and still function to this day. The original carriages and lines are rusted and time-worn—riding in one is quite a nail-biting experience indeed. I’m usually afraid of heights, but I didn’t hesitate to jump inside one trolley when we visited Chiatura in 2017 (I was also pleasantly surprised to find out that riding the cable cars is free!). The cable car stations in town—great hulking Soviet concrete creations—are also wonderful to see. Chiatura’s history and the legacy of the cable cars are often celebrated. In the past few years, the town has hosted film and photography exhibitions that pay homage to the town and its miners. Recently, a popular Georgian street artist known as Dr. Love created a mural depicting a miner inside the largest cable car station. Rumors about the cable cars closing down are constantly in circulation. So if like me, Chiatura features on your bucket list, you’d do well to visit soon. Turquoise sea and white sand beaches in Scotland? I know, I was as baffled as you as I watched images from home flash up on social media. Where had those beaches been hiding all of my life and why was I just seeing them now? The answer was down to a strong marketing strategy of Scotland‘s Highlands called the North Coast 500! The Summer we returned from travelling, we took the wheels for a spin along Scotland’s answer to route 66, starting at Inverness and up and around the Highlands. We visited the villages, beaches and of course, the local pubs. Our NC500 itinerary also entailed a visit to Smoo Cave at Durness and a hike up Stac Pollaidh near the ‘big’ village, Ullapool. Landscape lovers, hikers, historians, and foodies should definitely put the North Coast 500 on their bucket list! There is nothing more humbling than standing beneath the Himalayas and looking up at the enormous hills with snowy peaks. Ladakh is the most sparsely populated region in Kashmir, a state that is often dubbed as heaven on earth. The landscape of Ladakh is the unique combination of deserts in the Nubra valley, perennial water bodies like the Pangong lake, evergreen trees, and snow-covered mountains – all within an area of less than 87000 square km. I have seen pictures taken by people in ordinary mobile phones, without a filter and they look straight out of a movie. Ladakh is not just for the nature lovers. History buffs like me are fascinated by the land which has remains from the Neolithic age, the land has witnessed thousands of years of human civilization. Ladakh is also home to fascinating wildlife despite its sparse vegetation and extreme climate, most notable being the breathtakingly beautiful snow leopard. I have never been very lucky in sighting the wildlife, but I truly hope to see the snow leopard in the unapologetically wild terrain. For the adventure-lovers, how can we forget the Khardungla Pass, the highest motorable road in the world, the Magnetic Hill, and the Spituk Gompa- the monastery on the hill-top alluring trekkers and seekers alike? I have always dreamed of going to Ireland. When I was a child, I heard stories about this mystical country, its windswept landscapes and mysterious round towers and I made myself a promise: one day I would go and experience Ireland’s wildest beauty in person. I have indeed reached that goal: I have now been living in Ireland for over 10 years and still feel its fascination. One place, in particular, embodies the Ireland of my dreams and this place are the Slieve League Cliffs, in Donegal. Perched in the North East of the country, Sleave league Cliffs plunge into the Atlantic ocean from a height of over 600 metres. Much taller than the better known cliffs of Moher, they hold the record for being the tallest accessible sea cliffs in the country and among the highest in Europe and are a dramatic and breath-taking as they sound. The cliffs fall into the Atlantic with an almost vertical drop, the ocean smashing at their bottom with crashing waves. A soft layer of grass and heather bushes reaches vertigo inducing-edge and birds nest in the many nooks and crannies of the rock face, their screams audible for afar, carried by the strong winds of this area. The cliffs are accessible by a large path leading to a belvedere and are the one place in the country I never tire of. As such, they were first on my bucket list and still dominate it as I will never tire of them! Pakistan is probably not the first country that comes up for most people if they are looking for their perfect holiday destination. Pakistan does not even have it’s own Lonely Planet and is more likely to be associated with terrorism rather than gorgeous mountains, great hospitality, and a rich cultural heritage. But Pakistan definitely has this on offer and much more. It used to attract hundreds of travellers when it was still part of the old hippie trail from Europe to India until the media made people believe that Pakistan is a dangerous place. I am well aware that this is true to some degree and that Pakistan requires you to do your homework before you go. Certain areas around the border with Iran and Afghanistan are out of bounds, but Pakistan is a huge country that leaves enough areas to explore that are absolutely safe. However, few people take the risk and there is little information out there. Whomever I talked to that did tell me it is well worth the effort. Just look at Michael Palin’s series on the Himalaya and you see the astounding beauty of Pakistan. The highlight that put Pakistan firmly on my bucket list is the famous Karakorum Highway, the highest international road that runs from Islamabad in Pakistan all the way up to Kashgar in China through high mountain passes and lush valleys. Its where three great mountain ranges meet. The Hindukush, the Himalayas, and the Karakoram. With safety increasing, tourism is growing as well and I hope that soon enough I will be travelling through these lands. That iconic shot of the five towers beautifully shaped like lotus flowers silhouetted by the colors of sunrise instantly pulls you in. It’s that image that inspires the wanderlust to visit Angkor Wat. It’s a place that had been on my bucket list for years. When I did finally visit, it surpassed all expectations. Angkor Wat Archeological Park is the largest religious monument in the world. The jewel of the park is Angkor Wat itself. Any visit should begin with experiencing sunrise at Angkor Wat (though the best time to visit the temple itself is in the afternoon when the crowds have thinned). But the Angkor Wat Archeological Park is much more than just the Angkor Wat temple. It’s a sprawling complex of over 70 temples, each unique and captivating to explore. Together, they highlight the creative forces of the Khmer Empire from the 9th to the 12th centuries. Main temples include Bayon with its enigmatic faces, Ta Prohm where the jungle is swallowing the temple, and the Terrace of the Leper King with its endless rows of finely sculpted figures. The best, though, are the smaller temples still seemingly lost in the jungle. Coming upon them, with the crowds far away, you feel like you’ve become Indiana Jones discovering a forgotten civilization. After a full day of discovery, you can watch the sunset over the jungle from the temple Phnom Bakheng. It’s the perfect close to a day spent in another world. In another time. You could spend days at Angkor Wat and still not see everything. The best way to explore the temples is on your own via bicycle (many Siem Reap hotels offer rentals). Or, you can rent a tuk-tuk for the day if the heat and humidity of SE Asia are overbearing. Cappadocia had been on my bucket list forever! I can still remember my first time seeing Cappadocia on my feed. This magical place where hot air balloons rose every morning over a landscape that looked like it belonged to a different planet. Surely it couldn’t be real! I mean this had to be staged for a very extravagant photo shoot. Didn’t it? I knew that I just had to get myself there and Cappadocia went straight to the top of my bucket list. I celebrated turning 40 this May and I knew that there was nowhere else that I wanted to spend this milestone but I was literally blown away by just how beautiful this place truly is. There are not many places that you can go on the world and actually feel like you are stepping onto another planet. Cappadocia is a place that will make you believe in magic. Once a province of the Roman Empire, Cappadocia is now the sprawling area of central Turkey which lies between Aksaray in the west, Kayseri in the east and Nigde in the south. Modern Cappadocia is an incredible place, crisscrossed with valleys and dotted with dramatic rock formations that will make you feel like you are on the set of a science fiction movie. Thousands of years ago a group of ancient volcanoes, Mt Erciyes, Hasan and Melendiz, spewed out layer upon layer of thick tuff which blanketed the countryside for miles around. Over the centuries the wind and rain worked their magic on the soft rock, carving out spectacular gorges and leaving behind the dramatic pinnacles of rock – the ‘fairy chimneys’ – that have created the Cappadocian moonscape. It was literally a dream come true for me to visit Cappadocia. It was a birthday I will truly remember. I have lost track of the amount of times that I have said that I want to collect memories and not things. These are memories that will stay with me forever. If it isn’t already, Cappadocia needs to go straight onto your bucket list. I recently had the pleasure of ticking visiting rainbow mountains off my bucket list! In the last year or so I have been seeing rainbow mountains everywhere in all my social feeds. But for the most part, it was the same mountain time and again that featured, Peru’s Rainbow Mountain near Cusco. This is about as far in the world away as you can get from where I currently live. So imagine my delight when I discovered that THERE ARE RAINBOW MOUNTAINS IN CHINA! No longer are those who desire to see this natural phenomenon in person limited to just South America, there is now an Asia option which may be cheaper and closer to home for them! China’s Rainbow Mountains are located in Zhangye up near Inner Mongolia. The nearest major city in China is Xi’an (of Terracotta Warrior fame) at only two hours flight away (or seven hours by train). Once in the city of Zhang, an hour’s drive gets you to the Linze Danxia Scenic Area (China’s Rainbow Mountains). Here there are four viewing platforms to take in many kilometres of rainbow mountains! AND the Rainbow Mountains aren’t the only attraction in Zhangye! There are also Tibetan cave temples (The Mati Temple Grottoes Complex), one of the longest indoor supine wooden Buddha statues at 34.5m and a nightly food market with awesome beef noodle and pulled-meat filled-bread dishes to sample! Located in the Pacific Ocean, halfway between Hawaii and New Zealand, lies the often overlooked country of French Polynesia. Though Tahiti and Bora Bora are romanticized with images of overwater bungalows and crystal clear lagoons, not many people know much about this country and why travelling there can be so breathtakingly special. Beyond the excessive luxury resorts lie real, welcoming people, who’s ancestry and cultural traditions can be traced back thousands of years. The small fishing villages and cities feel lost in time, while every else you look is virtually untouched, from huge mountains to flat glassy lagoons. The landscape of the country spans from stunning ocean lagoons to jagged peaks and dense jungle waiting to be explored. You can spend your days here hiking inland, exploring the small cities and archaeological sites or out on the water swimming, snorkeling, diving, sailing or surfing one of the most iconic waves in the world, Teahupo’o. A few must do’s for any bucket list trip to French Polynesia include hiking jagged peaks, diving with the abundance of wildlife, learning about the local culture and cuisines and swimming in the beautiful lagoons. Whether you decide on a trip to luxury trip to Bora Bora or to get off the beaten path on a lesser-visited island, French Polynesia will charm you, it’ll relax you and best of all, it’s even more beautiful than it looks in photos. Bavaria, Germany’s largest state, has always been on the top of my bucket list. And that is because Bavaria has something for every traveler, be it a historian, a foodie, a thrill-seeker, or an occasional traveler. It is home to some of the prettiest cities in Germany, the mighty Bavarian Alps, Germany’s largest mountain Zugspitze, and a lot of history and good food. The capital city of Munich is well known for its annual Oktoberfest beer festival and beautiful ornate palaces such as the Munich Residenz and the Nymphenburg Palace. And if you did not already know, the oft-photographed, fairytale castle of Neuschwanstein is right here too. Historical Regensburg and picturesque Bamberg are among the numerous UNESCO World Heritage sites that Bavaria possesses. But if you are looking to do something adventurous, why not trek up the Zugspitze or hike around the Bavarian forests. And if food is on your list, try the mighty white asparagus of Schrobenhausen or the fried sausages of the oldest sausage kitchen in Regensburg. As I said, Bavaria has something for everyone! Spring is a great time to visit. Temperatures are mild and crowd thin. Summer, however, is more popular for outdoor activities and hyperactive beer gardens. Having said that, Bavaria also attracts a lot of tourists during the cold, chilly winters because of their famous Christmas markets. So, go to Bavaria whenever you will. It will always have something to excite you. As travel bloggers, we have seen many places but at the same time, it seems like our bucket list isn’t getting any shorter either. Still, we noticed that with every destination we checked of the list it became increasingly difficult to get that wow-experience in the next destination. Instead of being blown out of our socks by the next destination we started comparing it with the places we visited before. That’s what made Japan so special for us. Japan is unlike anything we had seen before. Tokyo has a different vibe than any other city we have visited. The Japanese may have been the most friendly and helpful people we have encountered in recent years. The streets in Tokyo are crowded at any time of the day. Thousands of people walking like ants in a chaotic but at the same time orderly stream while screaming billboards try to get their attention. But the moment you get lost in the urban jungle somebody will stop, look up from his phone, and offer you directions to where you want to go. Japanese are addicted to their phones and love all kinds of technological gadgets to make their lives more comfortable. Just have a look at the toilets that come with a manual or have a look inside the Yodobashi electronics store with 7 floors crammed with sometimes the craziest electrical devices. But despite their lead in electronics, they harbor a deep faith. Tokyo is full of Buddhist temples and Shintoism Shrines. It will be very hard to avoid temples and shrines during your trip to Japan. These contradictions also made this trip so special for us. At the top of several people’s bucket list and one of the 7 Wonders of the World, is the Great Wall of China. The wall is an engineering marvel and bears testimony to the technological advances of Imperial China. Visiting the Great Wall is a memorable travel experience. I visited the Mutianyu section of the Great Wall during a long layover in Beijing. The Mutianyu section is located just an hour and a half away from the Beijing airport and can be easily reached if you have upwards of 5 hours. The Mutianyu section is one of the best-preserved sections of the Great Wall and is magnificently fortified with elaborate watchtowers. On reaching the top of the wall via the cable car, I stood looking at the magnificent views over the mountains. You can also hike along the Great Wall and I strongly recommend doing this: standing and the walking on top of the Great Wall allowed me to appreciate its engineering and majestic design. While coming down, along with the cable car, Mutianyu also offers the choice of a toboggan ride down and this is lots of fun – especially for kids. Mongolia hasn’t always been at the top of my bucket list, but after seeing a blogger I really liked went there, I was hooked. The pictures and stories from her trip were so good, I ended up finding out everything I could about the country. I read books that took place there. I watched any movie or show that was even partially set there. I read every blog post I could find. And every now and then I look to see if I can find anything new that I haven’t read yet or I’ll just re-read or re-watch things. My dream is to overland through Mongolia and Central Asia. The Gobi Desert, the steppes, the nomadic culture, the remoteness. That is why I want to go. I even want to ride horses there and let me tell you, horses freak me out, but it’s part of the experience and it sounds wonderful. Once I started dreaming, I didn’t stop and I don’t plan to until I finally go. When I first told my mom I wanted to she said “Why? It looks so desolate!” and all I said was “Exactly!”. Easter Island is one of the most remote islands in the world. It is literally located in the middle of the South Pacific. Easter Island is under the jurisdiction of Chile in South America, but it’s a bit harder to get to. To visit the Island, you can hop on a six-hour flight from the capital of Santiago, or from Tahiti, some two hours away. The biggest draw of Easter Island is the big stone statues called Moais. There are more than 400 moai scattered throughout the island. And because the native people of Rapa Nui were so mysterious, there are still more questions than answers. Why did the Rapa Nui erect these statues? What happened to the native population? To get a glimpse into some possible answers, you can visit the excellent Father Sebastian Englert Anthropological Museum on the island. It is located not far from the town center of Hanga Roa. There, you can meet the only female moai ever discovered. You can see a moai eyeball and even the undeciphered scroll of the Rapa Nui language. Some of the things to do on Easter Island include Anakena Beach, Rano Raraku Quarry and Ahu Tahai. You can see hundreds of moais at these locations. If you are a certified scuba diver, you have to do the Moai Dive on Easter Island, where you’ll come face-to-face the only underwater moai. My fascination with the Isle of Skye began as a small child when, upon hearing its name for the very first time, my mind conjured images of magical floating islands drifting towards the stars. I’d always had a vibrant imagination and a love for fairytales, so when I learned that this stunning island in the Scottish Highlands does indeed contain many awe-inspiring places steeped in legend and local lore, I knew that I must someday journey to experience the magic myself. My favorites among such attractions include the Isle of Skye’s Fairy Glen and Fairy Pools, where waterfalls cascade over rocky terrain before falling into a pool of blue-tinted water that glitters with the sunlight. The island is known for its rugged mountains, medieval castles, charming seaside fishing villages, and exotic landscapes. Portree, Skye’s largest settlement, has gained popularity over social media for its pastel pink and blue houses that sit over the sea. 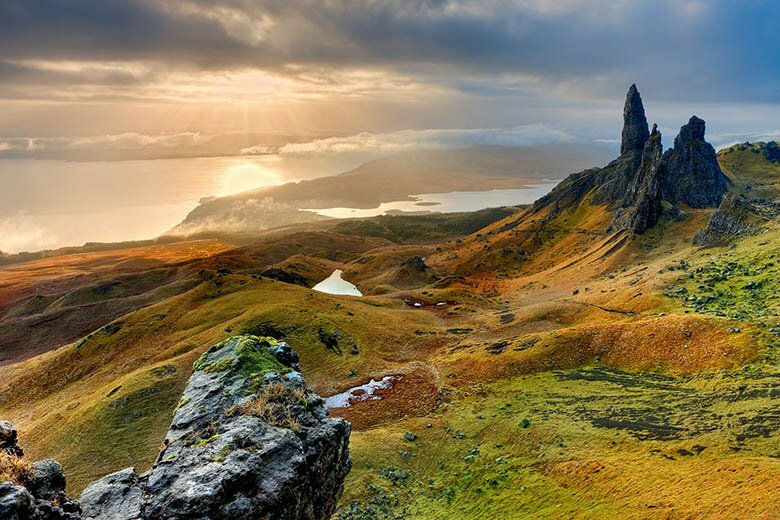 The uniquely-shaped rocky pinnacles of the 674-meter-tall Old Man of Storr is one of the most photographed landscapes in Scotland, and the black gabbro mountains of the Black Cuillin evoke dream-like feelings of faraway places that seem more appropriate for a fantasy novel than a setting in real life. The Isle of Skye has been on my bucket list for as long as I can remember, and I can’t wait until the day when my dreams finally take me to its shoreline, so I can hold its magic in my own two hands. If seeing giant pandas up close (including baby pandas) is on your travel bucket list, then you need to visit Chengdu, China. Chengdu is home to the Chengdu Research Base of Giant Panda Breeding – a research and breeding facility dedicated to the preservation of endangered giant pandas where you can observe numerous giant pandas playing, eating and just being adorable. There are also other panda bases located close to Chengdu that you can visit including the Dujiangyan Giant Panda base where you can hold a panda and volunteer as a panda keeper for a day. Although many people visit Chengdu just to see the giant pandas, the city has a lot more to offer. Chengdu is a great place to taste the spicy Sichuan cuisine, visit temples, participate in the tea house culture and see traditional Sichuanese opera. Don’t miss Renmin Park where you can get your ears cleaned or just people watch. Chengdu is also a good base for many interesting day trips including the Leshan Giant Buddha which is considered the largest and tallest stone Buddha statue in the world. Although most tourists normally need a visa to visit China, Chengdu is one of the cities that offer 72-hour visa-free entry for residents of certain countries that meet the requirements of the rule. Finally, Chengdu is affordable compared to other big cities in China and Asia so you can stay at a luxury hotel for the same price you would pay for a mid-price or budget hotel in other cities. They say New York is the city that never sleeps, but I beg to differ, the title belongs to Cairo! From the musical beeping of the car horns to the serene sounds of the adhan, the Islamic call to prayer, the city has something going on at all hours of the day! While recently, Egypt has had its share of ups and down, there couldn’t be a better time to visit and cross it off your bucket list – make your hard earned dollars go further and feel like an (Egyptian) queen! Cairo, in particular, is a city like no other and is often referred to as the ‘Mother of the World’, but often when you first arrive it feels as though you’ve been transported to another world! It’s a city known for its history, both recent but most particularly it’s ancient. As you walk through the cobblestone streets of Old Cairo, you’ll discover that there is so much more to the area than the Sphinx and the Pyramids. Cairo has hundreds of beautiful mosques, most famously the Mohamed Ali Mosque built on the citadel that overlooks the city. It also has many interesting museums such as the Egyptian Museum where you can see over 120,000 incredible relics including Tutankhamun’s Gold Mask. Don’t forget to take a break from the chaos either. Watch the city buzz from a distance as you sip some Arabic mint tea from your seat on a felucca, a traditional Egyptian boat as you sail along the Nile. When you finally come to Cairo, you’ll be itching to plan your next visit back! Munnar is one of the most spectacular destinations in Kerala, India and one that should be in everyone’s bucket list. Everyone who visits ends up falling in love with it, and it’s not surprising really. The landscapes are breathtaking, the climate is perfect and there are so many different ways to explore Munnar! Located about 80 miles from Kochi, Munnar is mostly known for its tea plantations, rolling hills of sculpted tea trees that will stop you on your tracks and make for a beautiful photo. You can visit some of the tea estates, and I would highly recommend the Lockhart Tea Plantation and Factory, where you can meet some of the tea pickers and learn about the tea making process and the different grades of tea. Going shopping in the market in the town of Munnar is a great way to get involved in the local life, and a great place to get some bargains too. You will find shops that sell local chocolate, sweets and little stalls that make and sell traditional flower garlands. A great time of the year to visit Munnar is spring when the jacaranda trees are in bloom. The combination of the vibrant green of the tea trees and the purple of the Jacaranda is a real spectacle of nature and the best place to witness it is in the Vagavurai Estate. In addition, the mass flowering of neelakurinji, a blanket of flowers that turn the hills purple, is a rare natural phenomenon that happens in Munnar every 12 years, between July and October. The current bloom is on this year, 2018. There really is plenty to see and do in Munnar! Now tell me, which of the destinations above would you drop everything just to go? (if money and time weren’t a problem, of course!). Comment below your answers, let’s talk! Did you like this post? Yaay! Then pin it to your Pinterest travel board! This entry was posted in Destinations and tagged Bucket List, Wanderlust. What a list, Bruna! I have been to only a few places from this list and can’t wait to visit them all!